I remember him. My brother had one. I totally had one. I too was born in 83 so this was the coolest thing around. Loved it! Wow, this really brings back some childhood memories. I totally had a Teddy Rubskin...that's totally what I called him as a child too. I still have mine, though I don't have the box anymore. Got him for my first birthday (was born in 85). Mom says I used to scream bloody murder every time someone turned him on. My girls remember him. We got my granddaughter Tickle Me Elmo and she cried for fear. She never played with him. That's an adorable commercial. I don't remember Teddy but I was already reading my college texts then. I'm feeling really old right now but I do still have a collection of teddy bears. Oh, Teddy. Daughter opted for a "Cricket" doll, instead. I loved him! I was 8 most of that year, but hey, I still loved stuffed animals. We didn't have a Teddy Ruxpin, but we did have a animatronic ALF toy that did the same stuff. He was AWESOME! I wish I still had that one! I think I paid close to $100 for my kid's Teddy Ruxpin back in about 1990! I HATED these things as a kid! They scared the crap out of me with their glassy, soul-less eyes! Oh yeah, I remember Teddy Ruxpin, the talking stuffed monster. He would speak to me in that creepy voice and, just for kicks, chase neighborhood kids down the road with a bloody knife. What a creepy bear. I thought it was possessed by the devil. 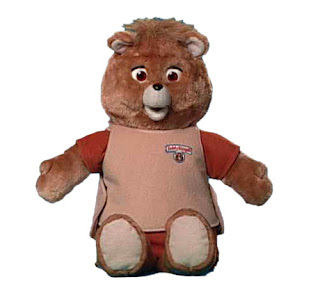 I never had a Teddy Ruxpin. I did have the Cricket doll. Remember her? She played tapes like Teddy did, but was a blue-eyed blond with a pleated skirt and Cindy Brady-esque curls. No one seems to remember her but me. I love the yawning kid in the commercial.